Super Bike Racer is an exciting racing game, developed by LongAnimals and RobotJam. Come to Super Bike Racer, you will feel familiar because the graphics of the game is quite similar to the racing game on NES. The game has 9 races and 3 cups (bronze cup, silver cup, gold cup) for you. And you need to unlock them from low to high. In order to unlock other races, you need to reach a high position in the previous races. For example, to unlock the second track you need to be in the top 5 of the first track. 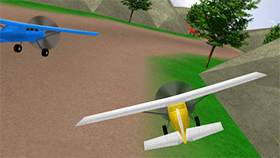 During the race, you can use the Nitro feature to speed up and surpass your opponent. However, this feature is only available for a while and has a cooldown time. In addition, the highlight of the game is the upgrade system for your motorbike. You can upgrade top speed, acceleration, drag, brakes, lean speed, grip, turbo power, turbo magnet. You need to have money to upgrade these features. Besides, you can also change the color of your motorbike and character, it's free. Use space to active Nitro. Based on the time and rank that the system will reward "the stars" for you. Each race has a maximum of 5 stars. The more stars you have, the more bonus you have.